Fresh from the Langka tree at our backyard. To bad I wasn't able to take pictures when it's not yet sliced to show how big the fruit was. 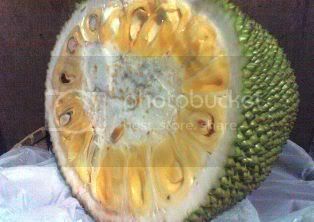 Langka or Nangka, which ever you prefer, has the distinct sweetness, very flavorful. Delicious! 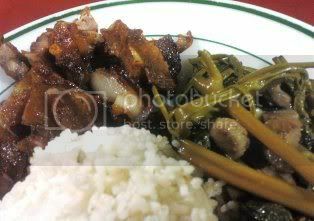 Adobong Kangkong and Fried Liempo! 1 big bowl of kangkong, separate leaves and stems cut into 2" length. On a large pan, heat the cooking oil then saute garlic & onion. Add the pork strips, stir fry for a few minutes until the pork browned. Season with soy sauce, vinegar and ground black pepper. Mix well to incorporate the flavors. Pour in the pork broth. Bring to boil. Simmer until the pork is cooked. Lower down the heat, cover and simmer until the kangkong is done. 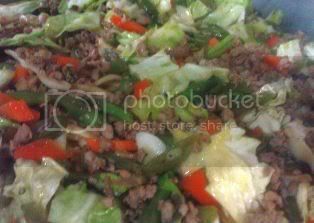 Serve hot with steamed rice and fried liempo. Saturday is market day here in Ibaan. And what I love about Saturday is that I've got the chance to indulge on different kakanin available at our local market. 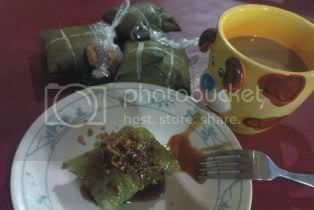 What I had this morning was Suman sa Lihiya. 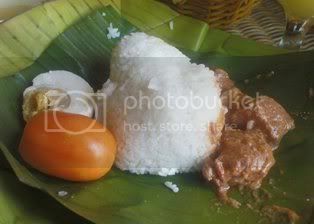 Suman sa Lihiya is a variety of suman made from malagkit rice (glutinous rice) soaked in lihiya (lye), drained and wrapped in banana leaves then boiled for about 2 hours. 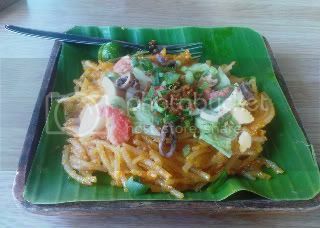 This is served with special latik (cooked grated coconut meat) and sugar syrup. Best enjoyed with a cup of coffee! The very first dish that I have learned to cook. There are many varieties & ways of cooking adobo. 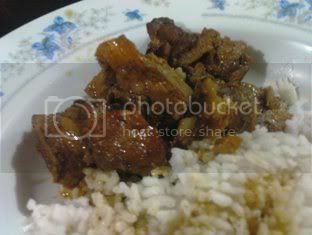 Everytime I cook adobo, regardless if its chicken, pork or a combination of both, I always put achuete. Aside from the nice color it brings, there's a distinct taste of slightly sweet & peppery. 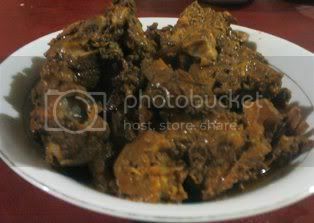 Adobong Binakbakan is the families favorite. ooppss... before we start cooking, infused achuete seeds on a small bowl with 3/4 cup of water and a pinch of salt until the desired color is obtained. Remove the achuete seeds. Set aside. On a casserole, saute onion & garlic. Add the pork, stir until the color of the pork turns into light brown. Add vinegar, soy sauce, pepper & the liquid from the achuete seeds. Mix thoroughly. (amount of seasonings depends on your taste). Simmer for about 5 minutes. Add about 3 cups of water, stir. Bring to boil, then simmer until the pork is cooked. Serve with steamed rice. 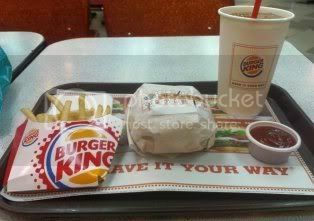 This is my first visit at Burger King at SM City Batangas. Thanks a lot to Maggie of Taste of Both Worlds. With this... I am happily passing this award to anya & deb. In a big pan, saute garlic & onion. Add the ground pork, stir until browned. 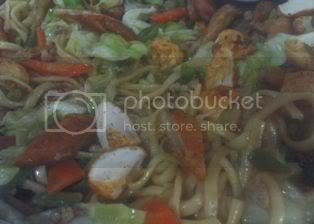 Add the vegetables, season with soy sauce and pepper. Remove the mixture from the pan, set aside. On the same pan, pour in chicken/pork broth. Bring to boil. Lower down the heat and simmer for 10 minutes. Add 3/4 of the vegetable mixture.Mix well. Put on a serving dish, top with the rest of the vegetable mixture. ***Calamansi is sqeezed on to the pansit before eating. If chicken/pork broth is not availabe, you can use a mixture of water and a boullion cube. You can also top it with fried squid balls (cut into four). 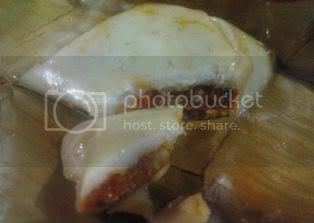 One of the local products I am truly proud of is Tamales Ibaan. Like tamales from other places it is basically made out of powdered rice, ground peanuts and chicken flakes, wrapped in banana leaves. But there's this distinct taste of Tamales Ibaan that people love. 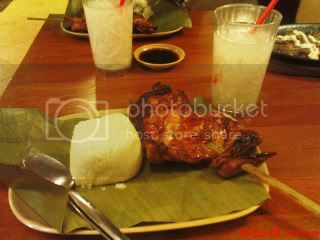 Had my lunch yesterday at Binalot (at Robinson's Place-Lipa), a fastfood offering traditional filipino meals wrapped in banana leaves. 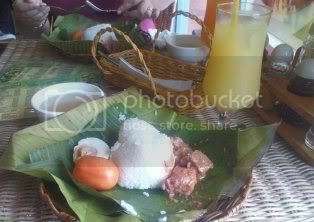 "Binalot" which means wrapped, is an old fashioned way of packing foods long before the plastic containers were introduced. One of the most popular street food in the Philippines. 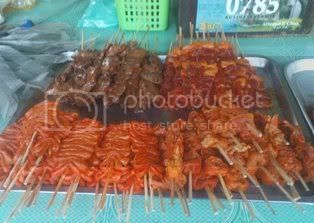 Isaw (barbecued chicken interstines) is considered to be one of the exotic foods available here. 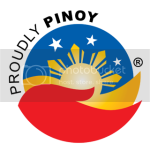 But for us Filipinos, this is a common thing. 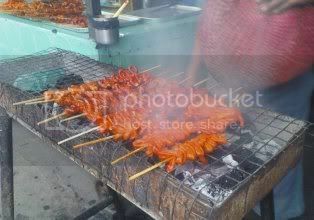 In every barbecue stand, you can always ask for isaw. 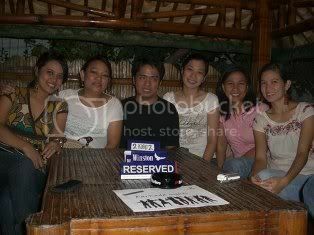 My officemates during the 1st Barkada Nights sponsored by the company I am working with. 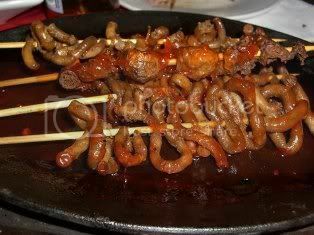 That was held at Al Fresco Bar (near SM City Batangas), they offer Isaw as "pulutan". 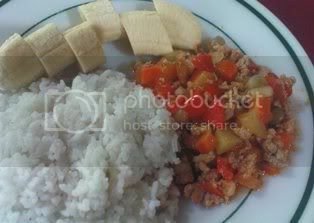 This might looked like an arroz a la cubana recipe, its just that I used ground pork here and I don't have sunny side up egg and fried bananas on side. On a casserole, brown the garlic then add the onion and tomatoes. Add in the ground pork, mix until the pork browned. Season with salt, pepper and a dash of achuete powder. Add in the potatoes, carrots, red bell pepper and green peas. Mix well. Simmer for another 10 minutes or until the vegetables are cooked. if you have left over of this dish, you can make a torta ( like a burger patties) out of it. Just add scrambled egg then pan-fry it. All your fortresses go down in the night. To the dawn I’ll see you through. You’re all over me now. But if your heart is cold, my sheets are warm. I will shelter you through the storm. I will shelter you all through the storm. The questions will have to do. My only fix is you. It’s a start towards the truth. All I can stand in my heart it’s you. One dish that most Batangueños love! 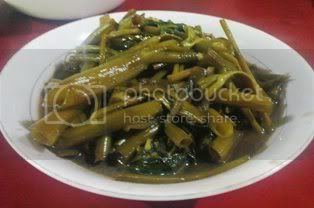 Please see my Sinaing na Tulingan (stewed bullet mackerel) recipe first. On a large pot, pour in the coconut milk. Bring to boil. Add the onion, garlic and a dash of ground black pepper, stir for about 2 minutes. Place the fish on the casserole carefully so it wont break apart. Add also about 2 tablespoon of fish sauce from the sinaing na tulingan. Top with chopped spring onions. Serve. If you don't have time to do the Sinaing na Tulingan, fry the fish first. Then follow the rest of the instruction. 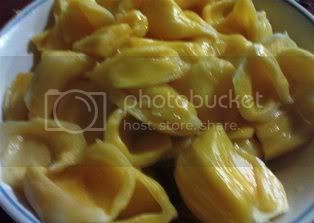 I prefer using the Sinaing na Tulingan because it is tastier. You can also add a teaspoon vinegar to add twist on its taste. 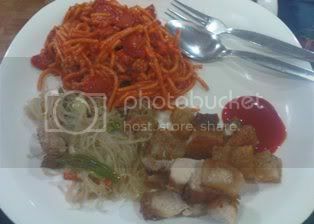 I've got super meaty spaghetti, pancit bihon and lechon kawali (pan-roasted pork). Yummy!!! 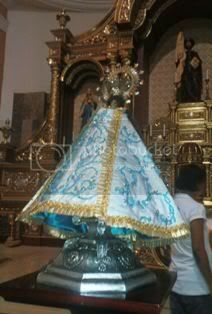 The visit of the Pilgrim Image of Our Lady of Caysasay at St. James the Greater Parish, Ibaan, Batangas. 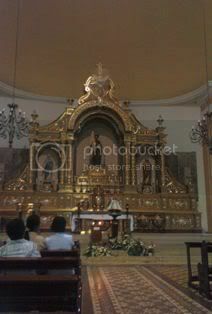 I'm an not a roman catholic, but when my friends asked me to join them going to their church, I do go with them. 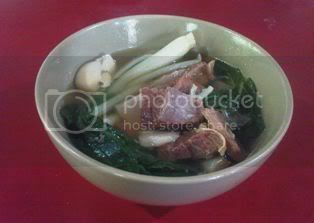 I love this dish especially during rainy season. On a large pot, place the beef, garlic and onion. Add water, about 2 inches above the beef. Bring to boil. Add salt and pepper. Cover and simmer until the beef is tender. Remove the scum as it arises. Add water if necessary. Put in the potatoes, simmer for another 15 minutes or until the potatoes are cooked. Adjust the taste by adding salt if needed. Add the pechay, lower down the heat and simmer for another 2 minutes. Serve hot with fish sauce and calamansi. 1. You can use pressure cooker to save time of waiting for the beef to be tender. 2. You can add other vegetables such as carrots, corn on the cob and sayote. 3. You can replace salt with fish sauce to taste. 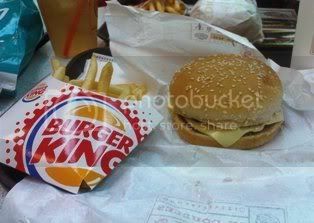 One of Batangas' native cuisine. 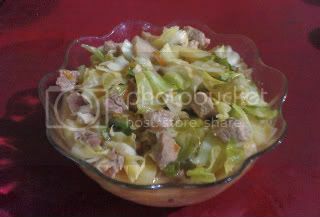 Being a Batangueña, my blog will not be complete without the recipe of this dish. Remove gills and all internal organs of the fish. Wash thoroughly under running water, until water runs clear. Slit both sides of the fish and press against the sides with palms of the hands to flatten the fish and soften its flesh. Rub fish with salt in and out. Lay the banana leaves at the bottom of a clay pot (palayok), then arrange the dried calamias. Put the fish side by side. Pour in water until it reaches the last layer of the fish. Bring to boil then simmer until the fish is cooked. You can continue simmering until you achieved the desired amount of fish sauce (patis). For me, this is best served with fried rice and a cup of kapeng barako. The longer you simmer the fish, the tastier and softer it gets! I have always liked pansit malabon, but this is the first time for me to eat at Pansit Malabon Express. Nestie & I accidentally pass by the store and we decided to have our lunch there. We're not disappointed because the food was great! 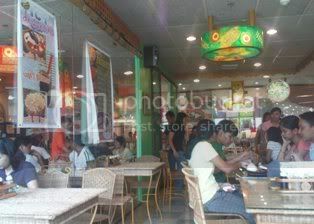 Aside from their main dish which is the Pancit Malabon Special, they also have different value meals to choose from. 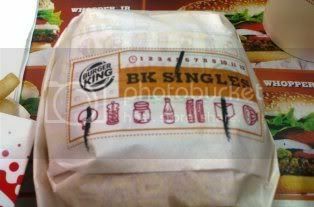 Like what Nestie ordered, Rellenong Bangus Meal, consist of rellenong bangus, kangkong with bagoong, pansit malabon and a cup of rice. Instead of rellenong bangus you may opt for pork chop, fried chicken, lumpiang shanghai and Lechon Malabon. I haven't tried cooking this dish, but I am planning to try. 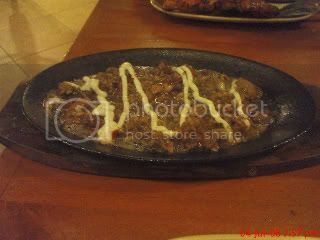 Kinamatisang Baboy or Pork Sauteed in Tomatoes. In every recipe, you can change the measurements of the ingredients based on your taste, especially when it comes to seasonings. On this recipe, you can add more tomatoes if you want it to be more sour. On a casserole, saute garlic, onion and tomatoes. Add the pork, stir fry until the juices from the tomatoes & the pork emerge. Season with salt & pepper. Mix well and simmer for about 3-4 minutes for the flavors to sink into the pork. Add the rice wash or water, bring to boil, cover and simmer for 20 minutes or until the pork is cooked. Put potatoes, when the potatoes are almost cooked, add the cabbage, mix and simmer for a minute or two. If fresh tomatoes are not available, tomato sauce or canned tomatoes will do. 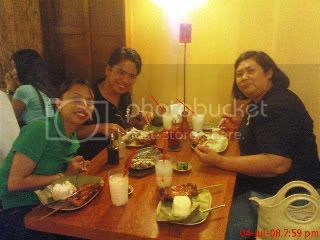 After a busy week... my friends from work decided to eat out... We went to SM City Lipa and dine at Bacolod Chicken Inasal. 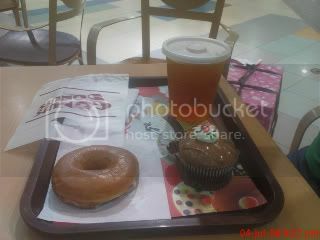 ...and after wandering around the mall... it's time to eat again! 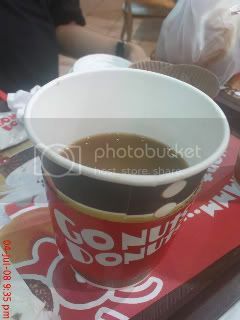 and of course... my daily dose of caffeine! Well this is what we have for lunch! 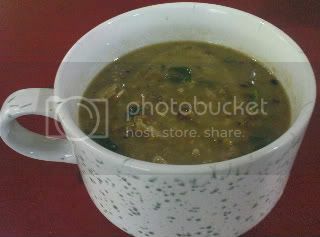 Ginisang monggo or mung beans soup, but for us here in Batangas, it is also known as Ginisang Balatong. In a casserole, saute garlic and onion. Add the ground pork, mix well until it slightly browned. Season with salt & pepper. Stir. Simmer for about 10 minutes to allow the flavors of the ingredients to blend. Stir in ampalaya tops, and simmer for half a minute. Best served with fried fish & steamed rice. Instead of ground pork, you can also use left over fish & fried pork. Shrimp also taste good with this recipe. If ampalaya tops are not available, you can also use malunggay leaves or squash tops.